The Plant Kingdom is highly complex and has been the subject of mystical intrigue since the beginning of time. As with any stationary object, plants must develop an internal ability to protect themselves from all manner of assaults, be it atmospheric or predatory. Part of their intrigue is their ability to adapt; plants sprayed with Roundup will become resistant to it in five generations. In the mid seventies, scientists were conducting studies on plants by attaching electrodes to them and measuring the plant reactions. The initial study was to see how the plants reacted to various conditions such as certain plant food, lack of food, or drought. However the experiment took a drastic turn when one scientists noted the needle went crazy when a particular scientist entered the room… the plants were practically shaking in their pots, terrified of her. Research discovered she chose to cremate her subjects following her experiments, tossing them into an incinerator as the others watched. It became proven scientific knowledge that plants had feelings and the ability to think. Following this information a movement ensued... talking to your plants would ensure happiness and healthy growth. It is the reason I still say ‘excuse me’ if I brush to harshly by a bush. As with all movements, this one fell out of favor as large companies altered the genetic make up of plants, thus altering many of their abilities. Scientific data of plant abilities is currently featured in Horticulture Magazine as a new generation rediscovers the magical mysteries of the Plant Kingdom. Using new technology Dr. Heidi Appel and Dr. Rex Crocroft at the University of Missouri, recorded the sound of caterpillars chewing on leaves and devised a system to test if plants had any reaction to it. Using a members of the cabbage family, they exposed one plant to the recording, another was not so fortunate. 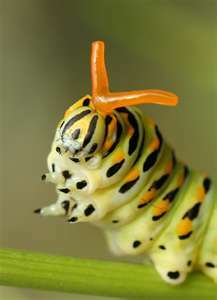 When the caterpillar was introduced in person, the cabbage exposed to the recording had already produced unpleasant tasting immunities that repelled the caterpillar. The other plant had not built immunities and lost most of her leaves to the voracious caterpillar. They further noted the plants knew the sound of a predator in contrast to other ’noises’ such as wind or crickets. They claim their work is the first to clearly illustrate plants response to vibrations. Even though it is terribly hot, perhaps stroll about the garden patting and praising all of the inhabitants dwelling there… they will thank you.